Every day I walk into the CPS Energy offices ready to tackle new challenges in Corporate Communications. Those challenges also include outdoor adventures, as I went toe-to-toe with my fellow interns in the third annual intern scavenger hunt! 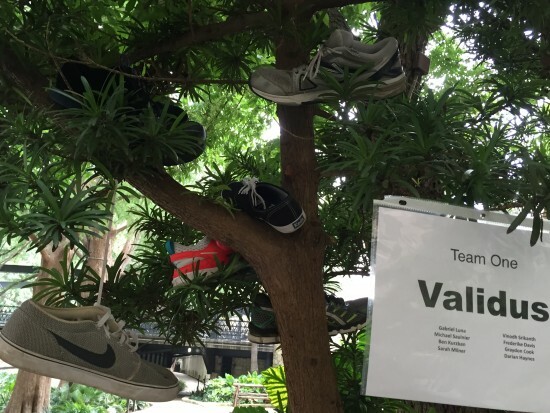 The scavenger hunt is a team-building activity that allows interns to develop communication, leadership, and time-management skills as we work with other interns from different parts of the company. We search downtown looking for unusual items or perform unique tasks to rack up points. scavenger hunt, showing them the value of their internship while having fun. They create new friendships and learn skills to help them in school or life in general; plus, I hope they learn that each individual has a strength that adds value to the team,” said Cristina Duarte who leads CPS Energy’s education programs. 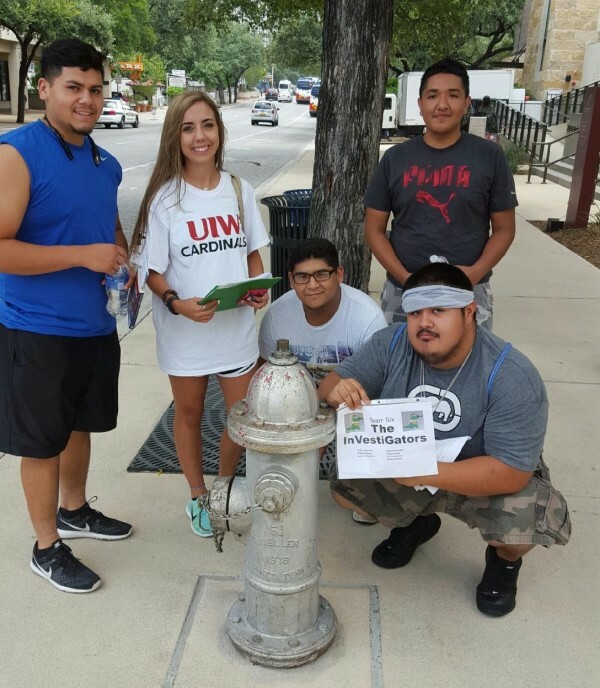 Forty-one interns participated in the scavenger hunt coordinated by SAFE (Student Assistance for Education) intern Kristina Lawrence. We formed teams of 6-8 people. Our first task? Decide on a team name. Sounds simple but communication, collaboration and negotiation skills prove to be a plus. My team chose Validus, which means strong in Latin. Our next decision was to decide which task to complete first since each earns different points. To get points, we had to take a picture of our team completing the task while showing our team sign. Our journey took us along the River Walk where we did yoga poses on a bridge, created a shoe tree, and became one with nature. The tasks allowed us to express our creativity and encouraged us to think outside of the box. We also visited the Alamo and Rivercenter Mall where we posed like robots, looked lost while sitting at a water fountain, and took a team selfie on an escalator. Personally, the most challenging task was figuring out how to capture all my teammates jumping in the air at once. After collaborating, we figured out that by recording a video of them jumping we could then take a snapshot of the clip where they’re in the air. After the scavenger hunt, we reviewed photos from all six teams to see different perspectives of completing the tasks. “It was great! I was able to learn about how people have different creativity levels and just being able to bond in a team with other people I didn’t know,” said Darian Haynes who’s interning with Landbase Services under Customer Engineering this summer. 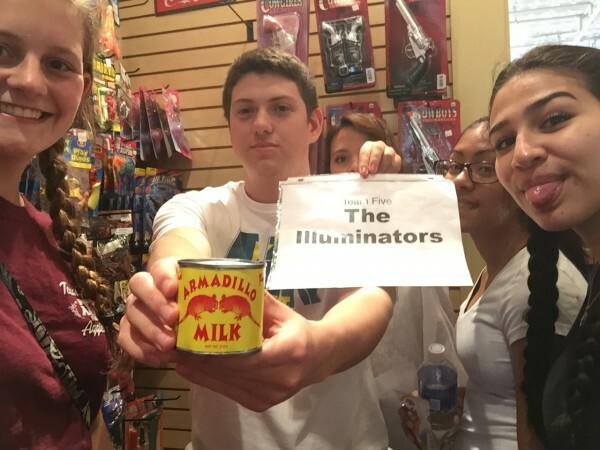 “The scavenger hunt is one of my favorite events of the summer! Along with getting better acquainted with downtown, I enjoy working with the other interns, as everyone has different thought processes and ideas about how to go about the task. It gives great real world experience in cooperating with other individuals with leadership skills and high intelligence,” added Sarah Milner, a Reliability and Power Quality intern. “The scavenger hunt was a blast. I met a lot of new interns and learned a few things about them along the way. The hunt was tough but we managed to complete a great amount of the objectives listed,” said Gabriel Luna, an intern at the Calaveras Power Station. After getting our dose of vitamin D in the sun, we happily returned to work the next day. The next few weeks are sure to fly by before the fall semester arrives. Thanks to our summer at CPS Energy, we’ll be stronger than ever with new social and work skills.